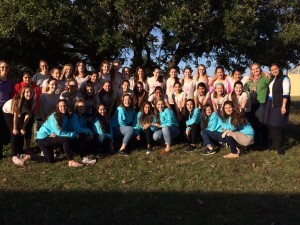 Article submitted by Rachel Peach, Regnum Christi consecrated working with the Challenge clubs in Houston. 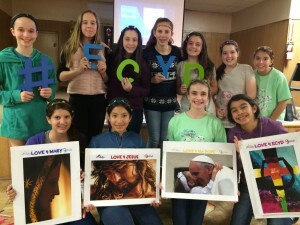 From December 4-6th, twenty-nine girls from all across Houston participated in an ECyD retreat themed: “Daughter of a King.” This 7 & 8th grade retreat took place at Holy Rosary Church, and was attended by girls representing seven of Houston’s Challenge clubs. The retreat was led by nine high school and college team leaders, two awesome moms, two Regnum Christi Missionaries- Maggie Munoz and Mimi Drapeau, and three Consecrated Women of Regnum Christ- Fabiola Zellek, Julian Frommling, and Rachel Peach. Fr. Matthew Schmitz, LC, was the chaplain of the retreat. There were a number of underling threads woven into the weekend retreat’s games and activities. We spoke about the misconceptions the world tells us about our worth, the example of the saints who have gone before us, confession as a means to let the King reclaim our hearts, and how to live as a Daughter of the King in everyday life. These messages took shape through various moments in the retreat during the fashion shows, skits, group discussions, adoration, and team-building activities. Information on the next “Daughter of the King” retreat tracks for 5th/6th grade (February 4-6th) and high school girls (February 19-21st) can be found on the Challenge Houston website: www.challengehouston.com.